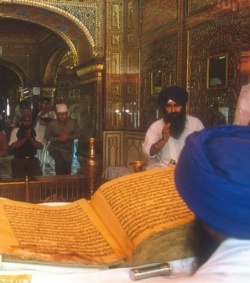 Shri Guru Granth Sahib Ji is the holy book of sikhism. It has 1430 pages and contains the actual words spoken by the Sikh Gurus and various other Saints from other religions including Hinduism, Islam, the Kabirpanthi religion and the Ravidasi religion. 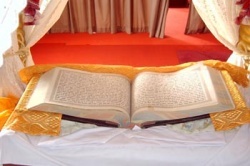 The Adi Granth is often used to refer to the Guru Granth Sahib. The Adi Granth is correctly only the portion of the Granth which Shri Guru Arjan Dev Ji compiled in 1604. This term is often used interchangeably so it is important to note the context within which it is used. 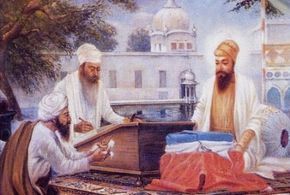 It is believed that the Shri Guru Granth Sahib Ji was made a guru by the last of the living Sikh Masters, Guru Gobind Singh Ji in 1708. Shri Guru Gobind Singh said before his demise that the Sikhs were to treat the Granth as their next Guru. Transliteration: Sab sikhan kō hukam hai gurū mānyō granth. All Peoples of the World are Equal. Live in God's Hukam (Universal Laws). Meditate on the name of God (Remember God). Practice Humility, Kindness, Compassion, Love.